Exterminate E.T.s and save the universe with this creature-killing guide. The lone space marine has become somewhat of an iconic figure in the video game world, symbolizing the struggle against overwhelming odds. 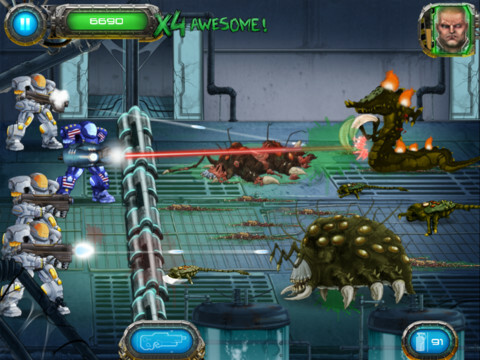 This is on full display in Soldier vs. Aliens from Bulkypix, a free-to-play iOS game that pits players against swarms of dangerous extraterrestrials. That said, you have two choices: stand tall and hold your ground, or become a tasty snack for some terrible beast. We certainly hope it's the former, which is why we wrote this Soldier vs. Aliens cheats and tips guide. Play the game, and you'll earn a modest number of credits, but let's face it. Eventually, you'll get stuck on a seemingly impossible board. If you lack patience, go ahead and pick up additional credits at the game's virtual store to help turn the tide. Why pay for credits when you can get some for free? By completing different requests and watching videos, you'll be able to score additional loot on the side. All weapons overheat if you press and hold the right side of the screen for too long. To prevent this from happening, lift your finger just before the gun craps out, press to shoot, then release. Rinse and repeat. The base model assault rifle will only get you so far. Don't get caught with a weak gun. Instead, spend some credits to boost its damage, firing rate and cool down time. The same goes for other weapons as well. Grenades are a life saver, especially when the "you know what" hits the fan; believe us, it will on multiple occasions. Chuck one of these suckers and watch as it blows a whole bunch of aliens back to Hell. Then deploy a turret to add an extra gun to the fight. On a side note, grenades are great for taking out the bigger aliens. Give the soldier a valuable armor boost by outfitting him with the best protective gear. This will make him much tougher to kill. As Hicks said in the movie Aliens, "We can't afford to let one of those bastards in here." Take his advice and protect the barrier, since losing it results in swarms of aliens attacking the soldier and most likely killing him in seconds. Every so often, a survivor will run across the screen. When this happens, do your best to run into this person just as he or she crosses the barrier, since you stand to gain a credit or weapon boost.